Donaldson helps semi-truck owners and users to meet critical emissions with filter-based solutions, DOC mufflers and crankcase filtration. Look to Donaldson for high-efficiency filter-based solutions, diesel oxidation catalyst mufflers and crankcase filtration. In addition to other diesel truck parts, Ring Power is now the Donaldson Certified Emission Dealer for Florida. Ring Power sells and services all semi-truck, buses, and heavy-duty on-highway diesel engine emissions and environmental needs. Donaldson’s full-line of products is available, from something as simple as a DOC (diesel oxidation catalyst) which simply replaces a standard muffler to a full-blown DPF (diesel particulate filter) system. Diesel engines are a reliable and efficient power source for vehicle and equipment manufacturers and, depending on the age of the engine, emit harmful emissions into the air. Governmental regulations across the globe are driving diesel engine users to consider buying new vehicles or retrofitting their existing engines to meet the new requirements. Donaldson takes a patented “total system approach” to retrofit – delivering solutions that reduce not just what comes out of your tailpipe, but offers a solution to eliminate emissions generated from the crankcase. We have CARB and U.S. EPA-verified solutions and an installation service network ready to help you select the best solution for your fleet. » DOC's which reduce particulate matter by as much as 20-25%. » Spiracle crankcase filtration systems eliminate harmful and unwanted crankcase emissions and allow crankcase to be closed without degrading performance which when combined with DOC's increase the reduction of particulate matter. 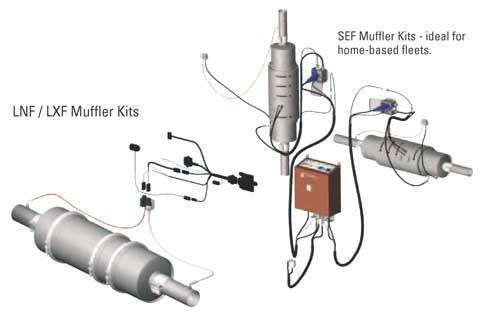 » SEF Muffler System (semi-active electric filter) which is a CARB level 3 DPF device. » LNF and LXF DPF muffler systems is a CARB level 3 device using passive technology. This provides the highest amount of PM reduction available today at >90%. Passive DPF's are sensitive to exhaust temperature and minimums must be met to ensure consistent and reliable DPF regeneration. » Complete emission retrofit kits, including installation hardware, are available. Ring Power is also your source for DPF filter cleaning. Give us a call to see how we can clean your DPF filter. You'll definitely be glad you did! Ring Power’s Truck Service Centers are full service centers for buses, semi-trucks, tractor trailers and heavy duty diesel trucks. We are located throughout north and central Florida in St. Augustine, Tallahassee, Perry, Lake City, Lakeland, Jacksonville, Gainesville, Ocala, Daytona Beach, Brooksville, Orlando, Tampa, and Palm Bay.